Logan hadn’t been there in a long time, since before Scarlett was born, so he was thoroughly enjoying the time. However, when it was time to go his teacher couldn’t get him to leave, so she told him they were going to another library. Bad move on her part. When they got back to school, Logan cried for the new library. He cried all the way home and cried to me when he got back, though we thought he was only crying cause he had to leave. It wasn’t until later that we found out what his teacher had told him. Poor boy. He kept asking to go to the new library, and even asked again this morning. She had better have an answer for him when he goes back to school on friday (he has two days off, local holiday) cause I’m sure he will ask. Watching your children grow is full of never-ending excitement and fun. Both of them are changing so much, so fast that I can’t keep up. Last night while feeding Lila her dinner, she started saying the sounds she knows – mama, dada – and then she added a new one: baba. She kept saying it over and over, repeating it every time I said it too. The funny thing is, she can say as many “words” as Logan can. She is learning from and copying him. Logan’s list of words is as follows: mama, dada, baba (baby, refering to Lila or any baby animal), na-na (food), and deow (there). At 2 years and 3 months, this is all he can say. Anything else is some version of uh uh. He uses lots of gestures but many times I don’t understand him. So I tell him “Show me what you’re talking about” and he’ll take me to whatever it is. Something new for him is that he has started saying animal noises. He can make sounds for the dog(sort of a high-pitched puppy bark), cat (he says “aum”), cow (again, a very high-pitched “Oooooowwww”), monkey (this one he got right), rooster (similar to the cow), fish (opens and closes mouth to make a smacking sound), and perhaps a few others. It’s cute to see him trying this as for about half a year now he has not tried to say anything new. I really hope he starts talking more soon as he gets frustrated at times when I don’t understand him. Also, at the rate she is going, Lila might pass him up with talking, just like she has with all the other motor skills she has that he didn’t at her age. Lila loves to interact with people. She will “talk” and get excited when she gets attention. She loves to play with Logan, too. Everything he has in his hands are most interesting at the moment and she has to have them, so she grabs them from him and the tears begin. I’m teaching him to get a toy for her so that he can trade her for the toy she took from him, but it doesn’t always work. She won’t let go of the one she has and shows minimal interest in what he is giving her…until he begins to play with it. Then she wants it. By that time he does too and the senario starts all over again. It keeps me busy all day. When she sees someone for the first time in the morning, she is all smiles and excited talk. She makes sure you know she is happy to see you. Sometimes I just look at her and wonder how I ended up with such an adorable baby. 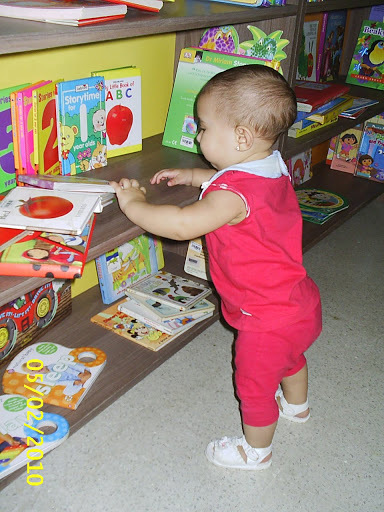 I took them both to the children’s library again yesterday. This is a small private library I discovered not too far from the park we go to. 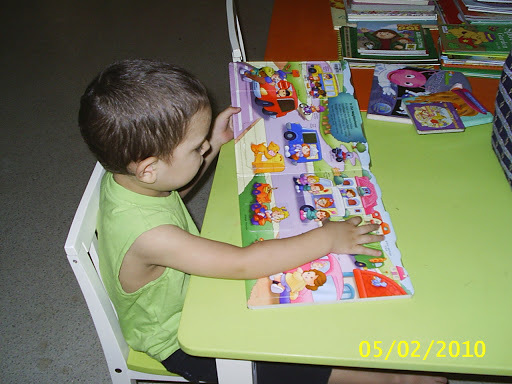 The books are divided by age so that all the books Logan will like are in one place. That makes it easy to get them. 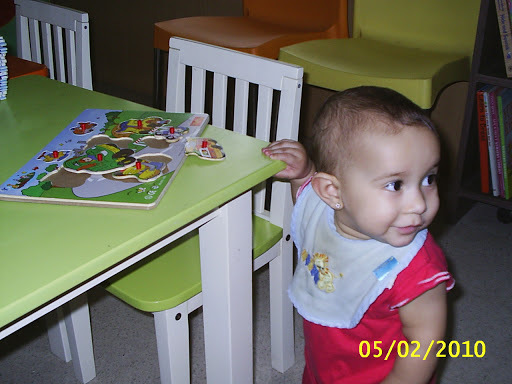 There are tables at the kids level, small child-sized beanbag chairs, and a room with wooden puzzles and toys. Both of them enjoy going there a lot. The attendant is very happy when they come and gives them lots of attention, Lila especially. She took Lila into the toy room yesterday and played with her while I read to Logan. Here are some pics from our previous visit. I think finding happy places like this is one of the joys of childhood. I want my children to have memories of fun times, places where they enjoyed themselves, and of just being children. They grow so quickly that too soon it will all be over and they will be thrust into the world of teenhood and then adulthood, with demands and pressures they never had before. I say let them be little while they can.